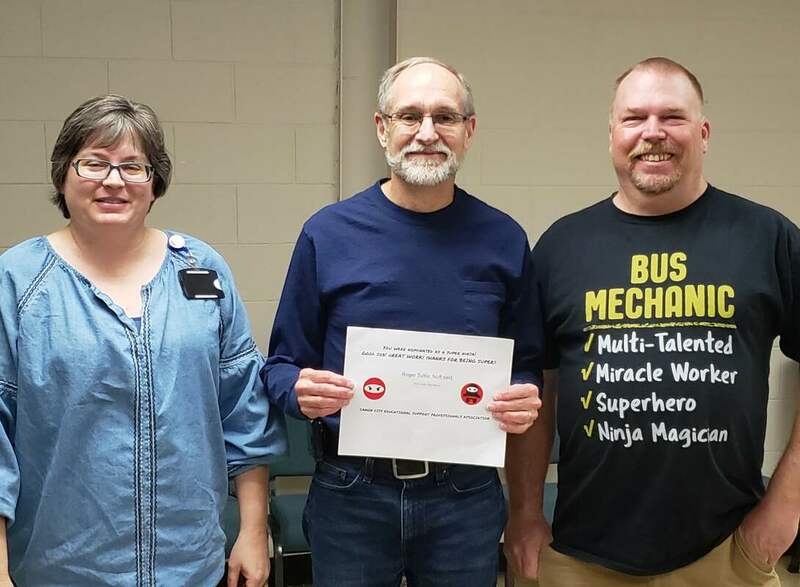 Roger Tuttle was named a Super Ninja by CCAESP co-presidents Jodi McKean and Kris Westhoff. 'Nuff Said! Jodi Steiber from Harrison K-8 was named one of our Super Ninjas for the second quarter of the 2018-19 school year. As a person who enjoys commuting on a bike, I'd like to offer deep appreciation for our regional health and wellness team, as well as our operations staff, for installing bike repair stations around town. This was made possible thanks to a Colorado Health Foundation grant, and no doubt many children and adults will make use of them. 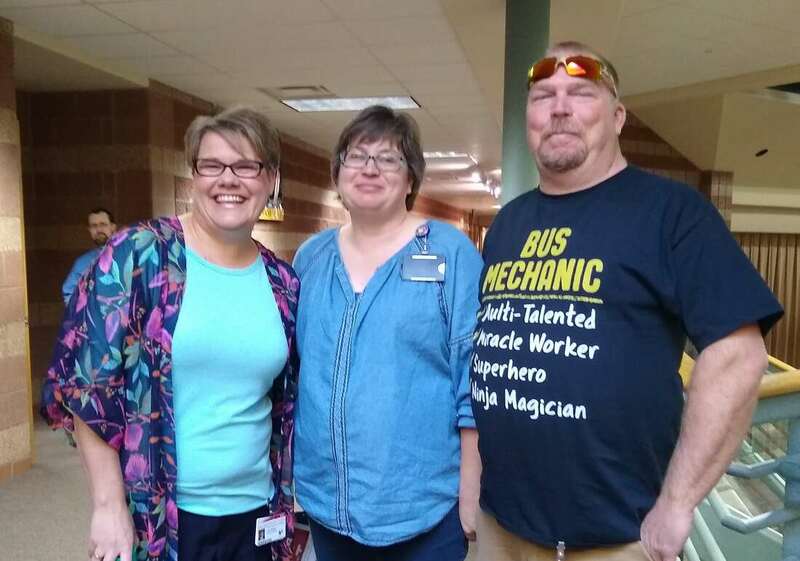 Paraprofessional Jodi Steiber from Harrison K-8 and Instructional Technology support staff member Roger Tuttle earned second quarter Super Ninja recognition last week. This award is sponsored every three months by the Cañon City Education Support Staff Professionals Association. Jodi was recognized because she always goes above and beyond the call of duty in her effort to support students. She genuinely cares about each child's social-emotional well being, and when she has crosswalk duty, she always has a smiling face and a friendly wave for students and visitors, no matter the weather condition. About Roger, his nomination form simply stated, "Roger Tuttle, 'Nuff said!" 'Nuff said indeed. Roger is an extremely talented technology support staff member who has been solely in charge of keeping more than 1,000 Chromebooks in good running condition for students at Cañon City High School and McKinley Elementary this year. Congratulations Jodi and Roger! Jamie Murray presents to the Fremont County 1451 Committee. At this month's Department of Human Services 1451 collaboration meeting Social-Emotional Learning Coordinator Jamie Murray shared the progress we're making as a district toward our first core belief, we meet the social-emotional needs of all students, putting Maslow’s Hierarchy of Needs before Bloom’s Taxonomy. At the gathering, Jamie reported that a district standardized referral system has been created for counseling referrals to GatewayTo Success and Solvista Health, counseling services are now being offered in elementary schools, 36 students are receiving individual counseling supports within the school setting, counseling groups are being provided at Cañon City Middle School and will soon begin at Cañon City High School, and that we're in a planning phase to initiate a counseling group at Choice Points. Jamie also reported she is in the process of discussing a suicide prevention training specific to Colorado that is offered online, that a CCHS team has completed training on self-harm and suicide ideation, and that CCHS counseling staff have been provided with mental health screeners in the areas of depression, anxiety, stress, and global functioning. Another major aspect of Jamie's presentation was about progress being made on the front of social-emotional screening of students at the high school, and eventually middle-school levels. 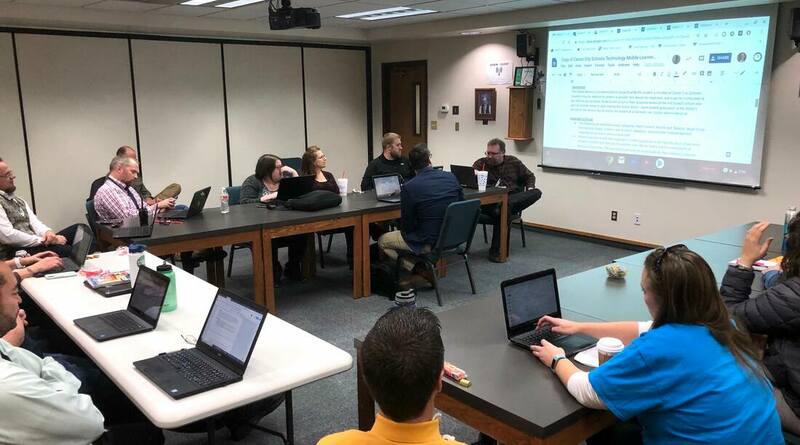 At our January Technology Visioning Committee meeting, committee members shared lessons learned to date from this year's Cañon City High School and McKinley Elementary Chromebook implementation. We then began work to update our technology action plan. Thanks to lower than expected costs related to our summer 2018 multi-facility improvement projects we were able to purchase upgraded classroom door hardware for all of our schools. These locksets meet the new Colorado safety requirement of being lockable from inside the classroom. On another front, earthwork on our new district grounds facility has begun. If you drive by district property near Cañon City High School just to the north of Icabone Pool you'll notice some deep holes being dug. Because of clay-laden soil, we have to put an extra thick foundation below this new structure. Last Monday I submitted a draft of our annual Unified Improvement Plan to the Colorado Department of Education online system. We also have a board work session and meeting. On Tuesday I traveled to Mapleton to attend a statewide gathering of superintendents continuing work on a more equitable education finance formula. On Wednesday we had a delayed start during which teachers engaged in professional development. At that time I attended an Opportunity Coalition legislative advocacy phone call. On Thursday I met with Director of Student Support Services Paula Buser and Director of Finance Buddy Lambrecht about our Nutrition Services program budget. That afternoon we also held a District Technology Visioning Committee meeting. On Friday I caught up on office correspondence and stopped by McKinley Elementary to observe classroom instruction. On Wednesday teachers from all over the district engaged in professional development activities. There was no school on Monday, January 21st in celebration of Martin Luther King Day. On Tuesday I'll start my day with a networking meeting, followed by Superintendent Advisory Council and an Instructional Leader Professional Learning Community gathering. On Wednesday I have an Opportunity Coalition legislative advocacy call, a series of meetings related to personnel and staffing matters, and an expulsion hearing. I'll end that day guiding the work of our calendar committee. On Thursday I have a touching base session with Brian Turner from SolVista, a Pikes Peak Alliance legislative advocacy call, a touching base meeting board president Larry Oddo, and a special board meeting to approve a wrestling trip out of state. On Friday I'll spend the day in Denver working on legislative advocacy. Have you heard Cañon City is a top 10 finalist to be featured on this year's Small Business Revolution TV show? This means Cañon City also has a shot at a $500,000 business support prize. As part of the show's decision-making process, host Amanda Brinkman and the Small Business Revolution film crews are coming to Cañon City on January 31st and February 1st. Many locals are hard at work doing their best to prepare for this important visit, and thanks to the Cañon City High School National Honor Society and JROTC programs, a lot was accomplished this weekend in preparation. This year Cañon City Schools has embarked on a process to identify ways to attract and retain high-quality educators to work with our children, in light of our statewide teacher shortage. Two avenues we have identified by which we could do so include being better at promoting the wonderful lifestyle our community offers and ensuring the types of businesses young folks like access to are available right here in town. As a result, it is our belief Cañon City's success in this competition would be a boon for our community, and for our kids! -Our feast or famine economy based on tourism. -The many tourists who travel through town but don’t stop to shop. -Our Main Street's inability to capitalize on Highway 50 visitor traffic. -That many of our small business owners are specialists in their fields but not necessarily specialists as marketers. -The fact that Cañon City suffers a lot of retail loss to Colorado Springs and Pueblo. -The City has made investments in downtown, an Arkansas River Corridor plan, and ways to promote downtown businesses. 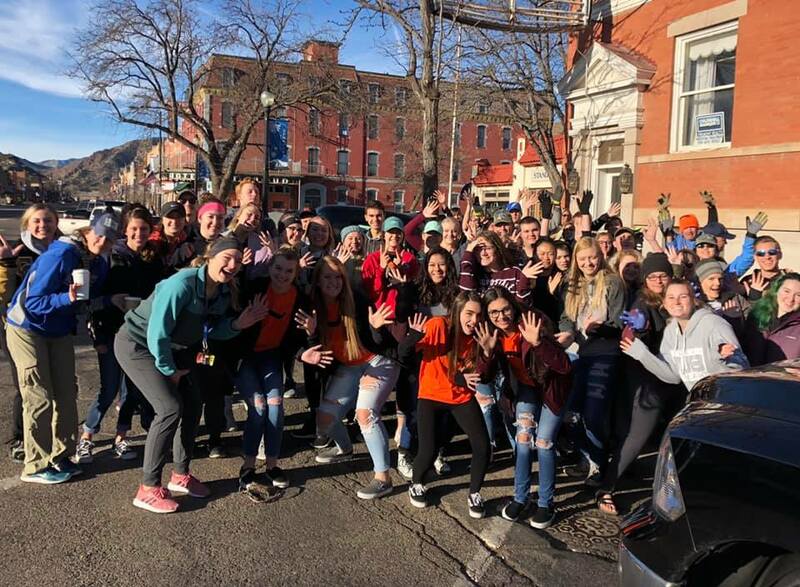 CCHS JROTV and NHS students supported Sunday's downtown cleanup effort. More than 50 students were involved in preparing Main Street for the Small Business Revolution visit. Other than cleaning up and showing pride in our community, as was done by a large group of kids and adults last Sunday, we can we all support this effort by doing two things, participating in a social media drive and attending a public rally on the day of the visit. Through social media, you can help by posting stories about local businesses by using the hashtag #mycanoncity and #smallbusinessrevolution. A public rally will be held on January 31st from 6:00 to 6:30 PM. The 500 Block of Main Street will be closed for this. In support of this, the Cañon City High School Band will be performing. If we make the top 5, the final decision will be made in an online poll. At that time I'll share how we can all help with that effort. Folks who have questions about all of this can call Economic Development Director Ryan Stevens at 719-429-1658. Thanks for listening once again.